Once a place where travellers used to stop, Mezzojuso lies on the Rocca Busambra slope and was set up in the mid XV century by a group of Albanian refugees. Today, the Albanian language and traditions are still alive among its people. It is worth visiting the Latin Mother church of the Annunziata, built by the Normans and restored in the XVI century, the Greek Mother church of San Nicolò (early XVI century), where six Byzantine pictures and a priceless silver Crucifix are, the church of the Immacolata and the church of Santa Maria delle Grazie (XVI century), retaining the Greek-Byzantine rite and featuring an iconostasis composed of with XV century Byzantine icons. The Basilian Monastery is annexed to the latter, and its library houses many a rare Greek codex and priceless XVI century editions. The Basilian cenoby is home to a n important ancient book restoration laboratory. Each year, on the last Carnival Sunday period, the town turns into a “theatrical scenery akin to one of Bruegel the Elder’s paintings, so swarming with actions that you are never finish discovering them…”. The main attraction is a folk pantomime representing the rivalry between theMastro di Campo (Master of the Field) and the King, who both wish to win the Queen’s heart. 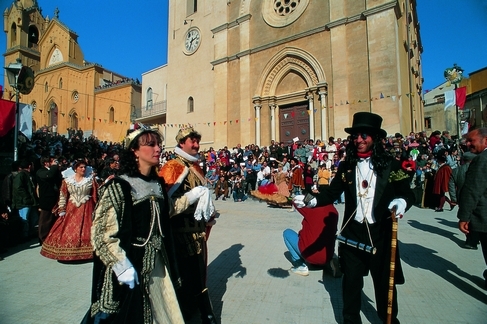 Hundreds of characters in XV century costume side with one adversary or the other, in a surreal atmosphere evoking ancient Sicilian rural traditions. You will end up eating barbecued sausages and drinking wine offered by the actors during their pause, amidst cannon shots, throws of confectionery and even the intervention of Garibaldians. You can enjoy many an excursion to Rocca Busambra and to the Ficuzzawood.